I can certainly say that this year's Sun 'N Fun got off to a much better start than last year. We had no EL NINO to deal with this year. On my way down to Lakeland the weather was much improved and more to my liking. But I would have to say that I was most impressed with the tailwind. At 5500' and (2600 rpm) heading east my GPS reported a 234 mph ground speed. Now that put a smile on my face. The weather at Lakeland was a basic warm/hot and dry. If you haven't made it down to Sun 'N Fun before, you should give it a try. Camping in Florida in mid-April is pretty enjoyable. The campgrounds have plenty of good shower facilities and the food services will get you by for a few days. We had a good turn out of Quickies this year. Nine planes made it in for the show. Dave Carlson brought his Q-2 all the way in from Tucson. Some of these guys have a good handle on their Revmasters and are putting plenty of hours on them. Mark Greenwood brought his TRI-Q-200 into SNF for the first time. Marion Brown came in with his newly powered Subaru Q. I also got a chance to get over to Winter Haven airport and visit a couple of Q-2's that I haven't seen before. Two of the nine planes we had show up were 1000-hour planes. 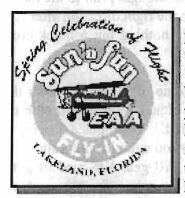 Sam Hoskins and Bob Malechek both had 1000 hours on the Q's prior to reaching Sun 'N Fun. Sam had crossed the 1K point on his way back from a trip to Texas a few weeks earlier. Bob hit the 1K mark on his way to the airshow. Congratulations to both of these guys. The Sunday forum was interesting and enjoyable for all. We had a great turnout and ended up with standing room only. Lots of new faces showed up for the two-hour forum. Everyone got a chance to talk about their current status and how things are going. Kurt Van Dyke was hoping to make a change over to a TRI-gear but has been unable to find an existing TRI-kit that could fit his budget. Well Walt Halloran stood up and offered Kurt a free nose gear and Marv Getten said he knew where a main bow gear might be available. This is the kind of internal support that really keeps the QBA going. The SUN 100 RACE was held on Monday morning. There were about 30 entries in the whole event and six planes in the 100-149 hp class. Three of these six planes were Q-200's. Bob Malechek, Sam Hoskins and Tom Moore were entered. Two of the other three were hopped up racers out of California. Klaus Savier brought his well-known racer in for the race. Needless to say the results were pretty interesting. The QBA HOT DOG ROAST was another success. Thanks go out to Dave and Susie Richardson for hosting this get-together again. We had about 25 QBAers show up and everyone had a good time. This was a $2.00 ALL YOU CAN EAT/DRINK (soda) event and I know nobody went home hungry. The hot dogs and chips were supplemented when the SNF roasted corn wagon drove by and about half of the crowd opted for a hot ear of roasted sweet corn. There was plenty of Q conversation for everyone and things lasted well into the night. This kind of relaxed time really offers a chance to get to know your fellow builders. Put SNF on your calendar for next year. It offers you a big motivational boost to get you going for a full summer of building and flying. Keep building, it's worth it!! You can order a PDF or printed copy of Q-talk #74 by using the Q-talk Back Issue Order Page.